I wasn’t going to write another post this weekend…. we are trying to get our property ready for Sustainable House Day which starts next weekend, and I shouldn’t be at this keyboard, again….. However, this very interesting piece of news just landed in my newsfeed, and it got me thinking, again….. It all started with this week’s announcement that QANTAS lost almost 3 billion dollars this last financial year. Then Virgin Australia (a smaller airline) lost 388 million dollars. I’m not exactly surprised. The last two times I flew to Tasmania, it cost about $400 return, or half what I remember paying 20 years ago when oil was only $10 a barrel! Then Malaysian Airlines, which admittedly has had its fair share of bad luck, has just announced it will cut 30 per cent of its workforce, trim routes and replace its CEO as part of a restructuring that will cost $2.03 billion….. The lowest seasonal supply of jet fuel on record is pushing prices higher and leading to voluntary restrictions in the New York region as the nation’s busiest air hub prepares for a holiday rush. Spot jet fuel in New York Harbor, the trading center for the U.S. East Coast, jumped to 22.5 cents a gallon above diesel futures this week, the biggest premium in three years. Stockpiles in the region fell to 8.83 million barrels last week, the lowest for this time of year since at least 1990, government data show. Airlines received an industrywide request yesterday to limit the fuel they take from John F. Kennedy International airport. How could this be happening, you may ask, as the US is producing more oil than it ever has in at least a decade? Well my dear reader, if you actually think about it, to produce all that oil, a fair bit of which is low ERoEI shale oil, you have to use a lot of that other stuff, the high ERoEI oil still coming out of conventional oil wells. What they do you see, is that they add up the production of the good stuff with the production of the awful stuff, and a really good number comes out of the spreadsheet. Trouble is, that total is NOT nett energy…. There is actually way less REAL energy available to put in those planes than the numbers tell you. So the people who leave comments on this blog saying ERoEI is irrelevant, here is proof that it is! Peak aviation may well be with us already. And I expect the cost of fuel and flying and driving may well be on the cusp of a sudden price rise, as Peak ALL liquid fuels is due to occur sometime around the end of this year, +/- 3 months. If you look at that error number….. it may have started right now! When I started this blog over five years ago, I was very enthusiastic, even waxing lyrical, over our solar power. Even though, in retrospect, our first system, as configured at the time, really was a complete waste of time and effort thanks to a badly designed and very expensive inverter. Live and learn…. Fifteen years ago, I was campaigning like crazy over the prospect of millions of Aussie roofs being plastered with panels feeding the grid. My faith in the technology was overwhelming, we could save the climate if only the political will came to be. And it did. Now millions of roofs are covered in grid feeding PVs. I take zero credit for this, make no mistake. Today however, I have a much deeper understanding of these issues, and I have made a remarkable turn around. So what now? Is Solar PV even a source of energy when one considers trying to ‘buffer’ it with storage? Does the energy cost of building the solar PV AND the storage render solar PV a net energy SINK rather than energy source? Or, in other words, do you pour more coal and gas and oil into building solar PV + storage than you get back as ‘clean’ energy? Apparently so! Not only this, but we need a minimum of 12 times the energy return on energy invested (ERoEI) to run the modern world. Solar thermal + storage only gives us 9, and that’s the best performing! Sorry folks. The ERoEI of a renewable grid + storage seems to be too low. 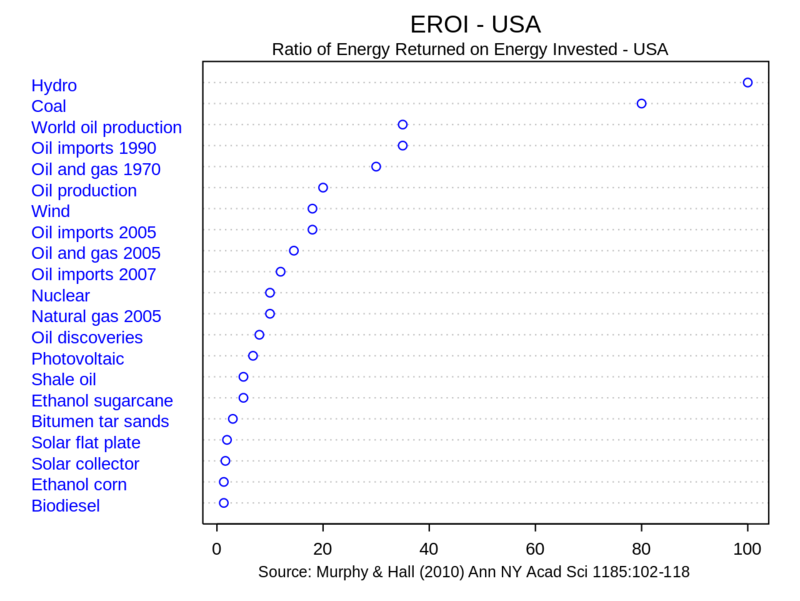 Nuclear has an ERoEI of about 75. It’s nuclear or it’s climate change. The science says so. So there you have it folks. 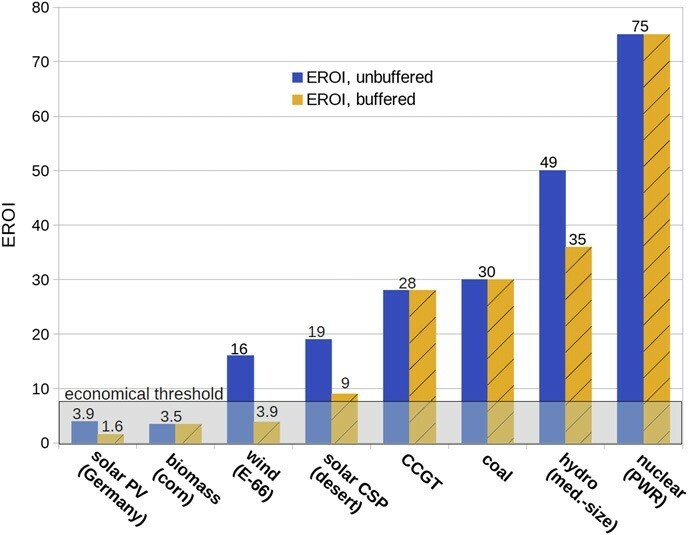 Solar is uneconomical (we already discovered this… plus that data is for Germany, and let’s face it Europe is not exactly a fantastic source of solar energy!) and nuclear is the only way to go……. except of course, this takes no account of the fact we are heading into financial meltdown, oil companies are going bankrupt, leaving us no money and no oil to even decommission the old nukes, let alone maintaining the grid. Besides, it seems you can justify any stand you wish to make with any set of data available. The pro-nuclear folk over at Brave New Climate may like to think nuclear has an ERoEI of 75, but plenty of other researchers disagree, just look at the chart above…. just TEN! So who do you believe? The grid itself will become the Achilles’ heel of future energy, not the source, and not storage. What we need is new thinking, a total revolution in the way we do things. The old system is irredeemably broken, we should not add any more ‘stuff’ to it, and we should definitely not spend any more money on it. Much gnashing of teeth and hand wringing is currently happening in Australia over the dismantling of the RET (Renewable Energy Target). The long-awaited review of Australia’s Renewable Energy Target has been released and, as widely predicted, has recommended winding back or even scrapping the various parts of the scheme. Of course, one would never expect a report commissioned by our Abbott government (well… any government actually!) to recommend closing down commerce and industry to save the remaining fossil fuels for a rainy day when renewable energy production will become extremely difficult and part of our nation’s survival strategy. There are campaigns up on the internet to fight the Warburton Report’s recommendations to slash the RET and incentives for rooftop PVs to continue as they are. But at the same time, we have to leave the coal in the ground, or guarantee catastrophic climate change. There are no choices here. 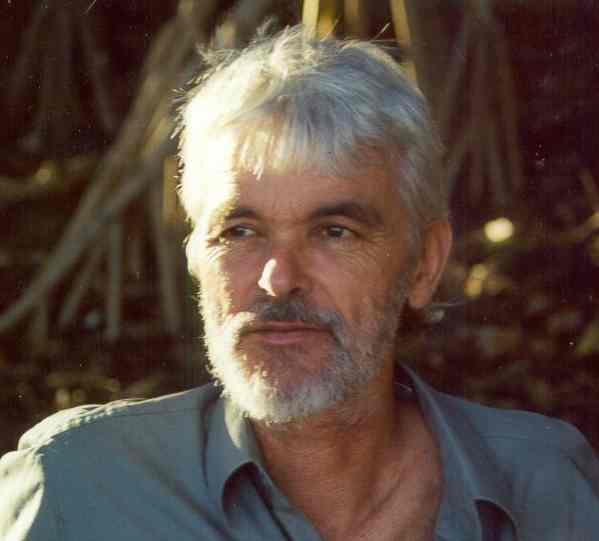 Every time we consume anything, whether it’s PVs or wind turbines or any other techno-fix……. CO2 ends up in the air, stays there for a thousand years, and none of the techno fixes remove the CO2. We squandered the best oil and the best coal in the 20th Century for trivial pursuits, and all we have left now are the scarps.. We used those precious fossil fuels to build freeways, huge cars, airplanes, skyscrapers…. and for what? Just look back, and most of those things no longer exist even! there are more cars on the scrap heap than on the roads. Ditto with airplanes. The current system is merely a means of turning resources into waste. It’s really that simple. And the powers that be want to continue this idiotic concept going to our final days of civilisation. The time for revolution has truly arrived. In many ways, I agree with the Warburton Report, but for completely different reasons. I hope I have made this very clear! The current campaigns against the Warburton Report are the wrong campaigns. I have no idea how to start the right campaigns. People everywhere, particularly some solar installers, are already starting to have a go at me for becoming anti solar. I don’t know that I have….. I feel that if we were smart about it, and reduced consumption to the levels I have proven possible here where we currently live, and stopped doing everything else, with a new economic system, new thinking, new attitudes, we could still “have our cake and eat it”, only it has to be a tiny cake. Finally, I thought I would put into perspective just how amazing fossil fuels are. 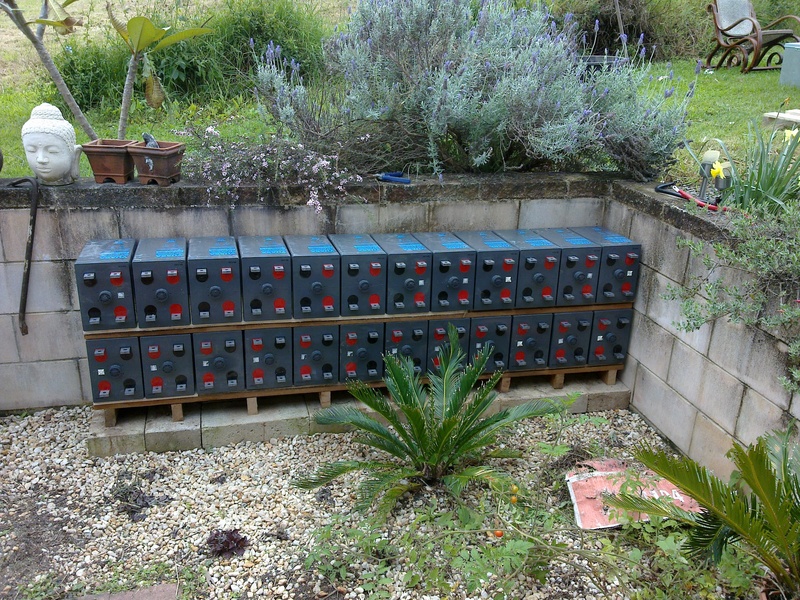 See that old battery bank of mine, which I sold when my first inverter died? It’s 2.4m long, 0.6m high, and 0.3m deep. That is a cubic capacity of 430 litres. It weighed 900 kilos. How much energy did it store? 24kWh when fully charged……. or about as much as 2.5L of petrol/gasoline. Yes, there is better battery technology than that on the horizon, but it doesn’t even come close to the energy density of petroleum derivatives. Just imagine what we could have done with stuff like that if we hadn’t wasted it all…. we could have kept a comfortable and sustainable low impact, low population civilisation going for a thousand years instead of less than a hundred. Now we’ve eaten most of the cake, and we have to deal with the crumbs. If you want my advice, get your panels and batteries now, along with a supply of inverters and other replacement electronics to ensure redundancy before it’s too late. Because the bastards in charge will do whatever it takes to stuff everything up. Prof. Tim Flannery, Prof. Ian Lowe, Prof. David Lindenmayer, Ian Dunlop, Uncle Bob Randall and others star in, Surviving Earth. Trailer 2014. China’s use of coal for electricity could peak as early as next year, then decline until 2020 in a turnaround of “global importance”, according to economist Ross Garnaut in a lecture presented at the Melbourne Sustainable Society Institute, University of Melbourne. The shift means the world has a much better chance of keeping global warming below 2 degrees C — the internationally-agreed guardrail against dangerous climate change. Slowing economic growth, increasing energy efficiency and growth in low-carbon electricity sources are driving the trend. The Chinese economy grew strongly between 2000 and 2011 by 11% each year, but has slowed to around 7% each year since. Combined with increasing energy efficiency, this is driving down growth in energy demand — to around 4% each year. At the same time, low-emissions electricity sources — hydro, wind, nuclear, solar and gas — have grown strongly, by around 4% each year. Because these sources are cheaper to use than coal, this has led to a “dramatic decoupling” of coal from economic growth, said Garnaut. Solar energy has recorded the fastest growth since 2010 — generation capacity of solar increased by over 140% between 2012 and 2013. But solar is difficult to predict, and Garnaut expects growth to slow up to 2020. Even so, low-carbon sources will continue to grow strongly until 2020. Wind power grew by nearly 40% between 2012 and 2013, and is forecast to grow by 18% each year until 2020. Over the same period nuclear grew by 14% and hydro by nearly 5%, and both are expected to grow at similar rates each year until 2020. Gas was more difficult to predict, due to uncertainty over domestic gas finds, but is forecast to grow by 25% each year. “Non-coal sources of energy account for virtually all the growth in electricity demand,” Garnaut said. While China would need to do more between 2020 and 2030, the projections suggest China has turned the corner. Garnaut based his projections on targets and policies already in action. He acknowledged that vested interests in coal, as in Australia, could slow the transition from coal to other energy sources, but said that the new model for economic growth was currently winning. More inspiring stuff from our friend Steve the Potter…..